• There are 197 rooms and suites. • Michelin-starred dining by Simon Rogan in Fera at Claridge’s, inspired by constant changing of seasons. • Contemporary Foyer and Reading Room restaurant serving breakfast lunch and dinner as well as Claridge’s award-winning afternoon tea. • The Fumoir, 1930s inspired glamour, serving coffee, drinks and cocktails. • Conference and events facilities including prestigious ballroom and newly refurbished sixth floor. •Claridges Health Club and Spa Located on the top floor offering tranquil and peaceful environment with stunning views. • Located in the heart of Mayfair district. 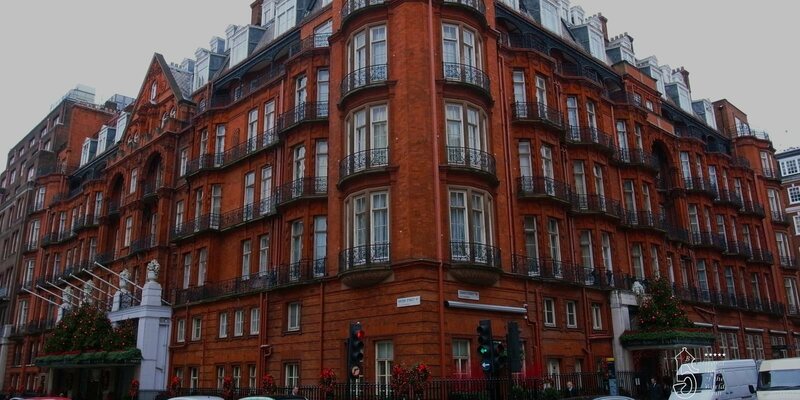 • 1812: Opening as Mivart’s Hotel in a conventional London townhouse. Over the years the first owner James Mivart is slowly expanding into some adjascent houses. • 1817: Acquisition of a second ajuscent house. • 1838: The Mivart's owns 5 connecting Houses on Brook Street. • 1854: Acquisition of the Hotel by Mr and Mrs Claridge, owners of a small neighboring Hotel. • 1856: Name changed to Claridge's. • 1860: Empress Eugenie (1826-1920) stays at the Hotel which widely contributed to it’s reputation. During her stay Queen Victoria (1819-1901) is invited to the Claridges Hotel. The Emperess of the French went to London to discover the Crystal Palace which had a later impact on the construction of the Pavillon Baltard in Paris. Emperess Eugenie was married to Napoleon III, the emperial couple of France is very much interested by everything Queen Victoria is doing. In some way there is even a certain competition between them. The Emperess gets many ideas from the Claridge's to style her own houses, the no longer existing Palais des Tuileries and the Chateau de Saint Cloud in or near Paris and the Villa Eugenie in Biarritz, today the Hotel du Palais. • 1894: Acquisition of the Claridge's by Richard D'Oyly Carte, founder of the Savoy Hotel and the Savoy Theater. • 1898: Reopening of the modernized Hotel with lifts and 203 rooms & suites with walk in bathrooms. The architect is Charles William Stephens who was also the architect for Harrods. • 1900: Richard D'Oyly Carte also buys the Berkeley Hotel, another iconic Grand Hotel in London. • 1901: Death of Richard D’Oyly Carte who is succeded by his son Rupert D’Oyly Carte (1876-1948). • 1904: François Bonnaure, previously chef at te Elysee Palace in Paris becomes the new chef of the Claridge's. • 1907: Marriage of Rupert D’Oyly Carte with Lady Dorothy Milner Gathorne-Hardy (1889–1977). • 1933: Bridget D’Oyly Carte starts to help her father manage the Hotels. • 19439 - 1945: World War 2, the Claridge's becomes home to many Monarchs and former heads of State on exile in London. The Claridge's is in some way considered as an extension of Buckingham Palace. Among them exiled monarchs King Peter of Yugoslavia lives at the Hotel. • 1945: July 17 Birth of Crown Prince Alexander of Serbia in suite 212 of the Hotel. By request of Winston Churchill, the suite is declared Yugoslavian territory for the day to allow the Crown Prince to be born in Serbia. See article from the website of Crown Prince Alexander. • 1948: September 12 Death of Rupert D’Oyly Carte at the Savoy Hotel. His daughter Bridget inherits the Hotels and the Theater company. • 1950s: Hollywood stars Audrey Heptburn and Cary Grand use the Claridge's as their London residence. • 1970s: Fashion Designer Princess Diane von Fuerstenberg becomes an interior decorator for the Hotel. Jacky Kennedy Onassis stays at the Hotel when in London. • 1985: Death of Bridget D’Oyly Carte without children giving an end to the family ownership of the Hotel. Her trustees continue to manage the Hotels. • 1998: Sale of the Savoy Hotels Group for $867 millian to the US private equity funds Blackstone and Colony capital. • 1998: The Causerie is transformed into Claridge's Bar by the designer David Collins. • 2004: Derek Quinlan and Patrick Mc Killen buy the Savoy Hotels Group and sells the Savoy. • 2005: January 24 The former Savoy Hotels Group is renamed Maybourn Hotels. • 2011: Sir David Barclay and his twin brother Sir Frederick Barclay buy a minority stake in the Maybourne Hotel Group. • 2012: David Linley (son of the Queen's sister Princess Margaret) designs 25 Linley Suites at the Hotel. • 2014: June 4 Fundraising diner by Crown Prince Alexander of Serbia see also 1945. • 2014: Opening of Fera Restaurant at the Hotel. Food is created by Simon Rogan.